● Most coupons at Emitations offer either percentage or dollar savings on minimum spends (e.g. 10% Off $75, $10 Off $100). ● Those who sign up to the email list also get $10 off their first order of $50 or more plus first-hand access to exclusive offers and promos. ● Shoppers can also save up to 50% on clearance jewelry such as clearance rings, clearance earrings, and more.. All they need to do is go to each category and click on the clearance section to view all clearance jewelry for that category. There is usually a promo code required at checkout and this is displayed on the main banner of the category clearance page. ● The online store offers free shipping on USA orders worth $50, Canada orders worth $75, and worldwide orders worth $100. Visitors to the Emitations website are going to be able to purchase sterling silver jewelry sets, CZ jewelry pieces, imitation and custom jewelry sets, and more at deeply discounted prices. All of the different pieces available from this website have been designed to closely emulate and imitate jewelry pieces from some of the most popular designers around the world, and many of them look as close to the real thing as possible but are available at a fraction of the price. Almost all of the pieces of jewelry that this company provides are going to pass as the real deal, and many of them have even fold legitimate jewelers before they have a chance to more closely inspect them. 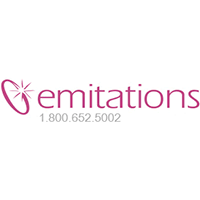 For most up to date offers check out Emitations on Facebook and Twitter or contact Emitations Support for any questions.